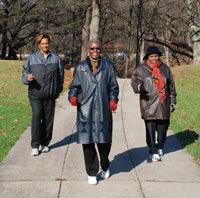 Shirley Robinson (center) takes a brisk walk in Franklin Park with two friends, Christine Holley (left) and Roma McKenzie-Campbell. Harold Sealls is a natural athlete. He played football back in high school and has kept in shape for years — so much so that now, at the age of 50, he says he is in the best shape of his life. He should be. He’s been working out since he was 12. Back then he used the money he earned delivering newspapers to purchase his first set of weights. He still owns another set he bought almost 30 years ago. “They’re sitting in my living room,” he said, quickly pointing out that they are not simply collecting dust. Roosevelt Robinson is the name his mama gave him, but he goes by Master Heg. He practices and teaches t’ai chi ch’uan, an ancient Chinese martial art that uses rhythmic movements, meditation and breathing for health and self-defense. Now 65 years old, he says that his inauguration into t’ai chi occurred years ago. He just didn’t know it. As a young boy, he worked with his father on a two-man saw. Both had to be in sync with one another. “Boy, you don’t move if I don’t move,” his father warned him. Participating in regular exercise that benefits health is one of the most important and effective lifestyle changes a person can make. 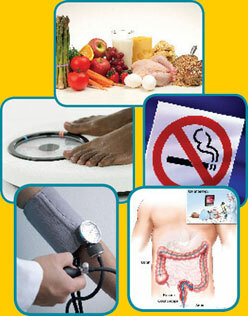 The good news is that there is not a particular exercise one must do to improve one’s health. Any aerobic exercise — one that makes the heart beat faster — will do as long as it’s done at moderate or vigorous intensity for a minimum of 10 minutes at a time. But any exercise is better than none.